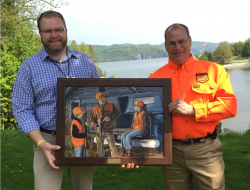 Jon Zinnel, Education Specialist for Federal Premium Ammunition (left) presents Rick Cerwick of Iowa (right) with the 2015 IHEA Instructor of the Year Award (art print). ANOKA, Minn. – Federal Premium Ammunition announced Rick Cerwick of Des Moines, Iowa, as the recipient of the 2015 International Hunter Education Association-USA (IHEA-USA) Volunteer Instructor of the Year Award during the 2016 IHEA Annual Conference. Cerwick was recognized for his career achievements and contributions to hunter education among 250 of his hunter education peers at the 2016 IHEA-USA Annual Conference. He is an IHEA-USA life member who has certified over 5,000 students across 75 courses in his tenure as an IHEA-USA instructor. In his home state, he received the Iowa Hunter Education Instructor Association Instructor of the Year award in 2015, following more than two decades of dedicated volunteerism. The prestigious award was presented to Cerwick during a special Federal Premium sponsored award luncheon. The 2016 IHEA-USA Annual Conference, was hosted by the Vermont Fish and Wildlife Department May 23 to 26, at the Basin Harbor Club on Lake Champlain in Vergennes, Vermont.